Kurinji Educational Institutions, Namakkal has advertised in DINATHANTHI newspaper for recruitment of Teachers jobs vacancies. 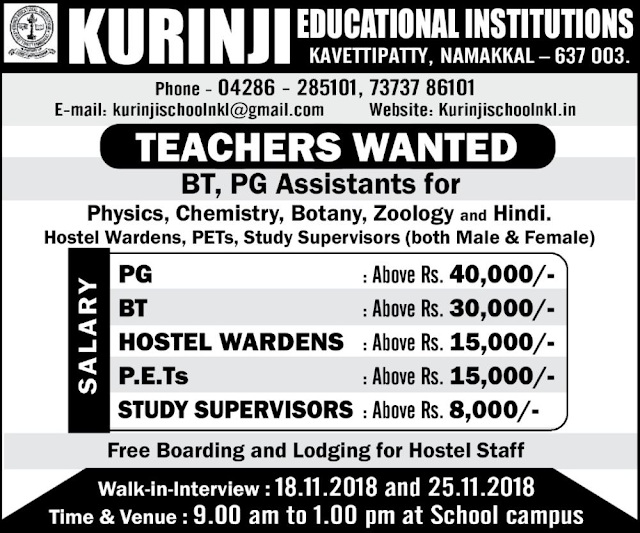 Interested and eligible job aspirants are requested to walk-in on 18th and 25th November 2018. Check out further more details below. About School: Ayya Nadar Janaki Ammal College is an autonomous college in Sivakasi in the Indian state of Tamil Nadu, affiliated to Madurai Kamaraj University, Madurai regarded as a college with Potential for Excellence. How to Apply: Interested candidates are requested to attend the Walk-in interview along with CV, originals & copies of certificates and recent PP size photos to the walk-in address mentioned below.